Stroke means a condition in which there is an insufficient flow of blood and oxygen to the brain, caused by a blockage or rupture of blood vessels, causing damage and rapid death of brain cells and, consequently, loss of function in this region of the central nervous system, as a result of permanent death of cells in the central nervous system which do not regenerate. It is estimated that every six minutes one person in the world suffers a stroke. In developed countries, this is the second cause of death in women and the fifth in men, and in Europe stroke in women is the leading cause of death. What are the first signs and symptoms of a stroke, preventive action, how is it treated and how to recover from a stroke Find out below. The most common symptoms of a stroke are paralysis of the right or the left half of the body (face, hands and feet), the inability of normal spelling of words or understanding speech, numbness of one half of the body, interference with vision, double vision, confusion, or even serious, previously unknown severe headache. These first symptoms begin suddenly, it is necessary that the person to immediately go to the emergency department. When it comes to risk factors symptoms of stroke in women after entering menopause are much more common, and then they are because they much more vulnerable, and should certainly have heightened awareness of the risk of stroke in specific situations during the life (pregnancy , period of confinement - puerperium time use of oral contraceptives). Although we know that men are more likely to suffer from stroke, stroke in women is much more dangerous and often ends in death. Specifically, as the average life of women is longer than men, the risk of a life with a stroke with fatal consequences is far greater than in males. Women must therefore be aware of the risk factors, acting in middle age increases the risk of stroke in elderly for years, and they are, above all, obesity, hypertension, diabetes and smoking. All recent medical findings in the past twenty years suggest that stroke and can be treated, as the main prerequisite for the rapid detection of symptoms and appropriate responses, both for the patient, and the entire health care system that is bound to help him. In the treatment of this disease the first three to four hours are critical from the beginning of the onset of symptoms. There are strict medical criteria used to determine which patients may receive treatment, which if applied in time, successfully break down the clot that caused the stroke, reducing the consequences of this disease. WHAT IF THE SYMPTOMS OF STROKE ARE ABSENT? The so-called silent stroke, is no longer a novelty and a complete unknown. One major US study showed that among 2,000 apparently healthy adults, average age 62 years, ten percent had signs of silent strokes in the images of the brain magnetic resonance imaging. So, with these people the symptoms and signs of stroke never existed. It is important to know that silent strokes more often revealed in people with high blood pressure, especially systolic, those with special abnormal heart rhythm or absolute arrhythmia, as well as in people with atherosclerosis that affected carotid artery. Also, to an increased risks of stroke elderly, diabetics and long-time smokers are exposed the most. Easily the symptoms of a stroke are clinically manifested, are associated with impaired memory and other higher brain functions, with depression, as well as unstable walking and frequent falls. Thus, the silent symptoms are not innocent, especially as they have a tendency to repeat, without warning. How to recognize a stroke of this type? Of course, there are ways to detect it, the best measure is prevention, regular visits to the doctor, treatment of diseases such as high blood pressure, blood lipids, it is recommended to quit smoking cigarettes, and to have physical activity and proper nutrition. It is believed that the risk of stroke is repeated in the same month of the first stroke. However, once you experience it, the risk that it will repeat stays increased in the coming years, even decades later. Statistics show that five years after the stroke, a new stroke is experienced in the at least 25 percent of the people. Repeated episodes are more common in older patients, those with high blood pressure or diabetes, smokers and those who have a special type of heart rhythm disorders - absolute arrhythmia. 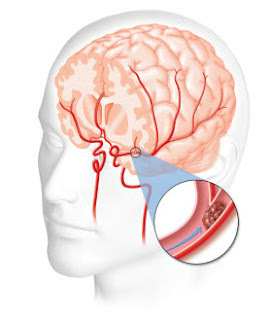 That you will have the stroke again is affected by the mechanism that caused the first one – it is especially dangerous if it was a thrombus that ran from the heart or carotid artery. After repeated stroke there is an increased risk that the patient does not recover from the damage, and that there will be a resulting memory loss, depression, and even death. New stroke can be prevented. It is necessary to apply the so-called secondary prevention measures, which involves the use of certain drugs (sometimes surgical interventions), control of risk factors, changing lifestyle habits, your doctor will explain everything. In the event that there are first symptoms of stroke you should report immediately to a specialist. Mini stroke or transient ischemic attack (TIA) is a transient disturbance of cerebral circulation, which by definition leaves no neurological deficit, although this does not mean that there has been any damage to the brain, interferences are transient, behind them stands a pathological state of cerebral circulation. TIA is extremely important because it is a warning sign and can be the announcement of a stroke! It is a unique opportunity to prevent illness at the time, and so it is important that patients with transient disturbances immediately visit a doctor. One in five patients who suffered a mild stroke had warning signs in the past week, mostly in the last two days! The causes of TIA and ischemic stroke are the same. Early assessment of doctors can help prevent the occurrence of diseases. The patient as a rule has inspections aimed at detecting mechanism for interference and introduce certain drugs. According to world statistics, if patients with TIA are determined an appropriate therapy immediately, on the first day, the risk of stroke in the first three months falls from ten to two percent. So do not wait for symptoms of a stroke on their own to pass, but immediately contact your doctor. The general recommendations and the best prevention of stroke is healthy, correct and fine-balanced diet with regular physical activity, and to spend as much time in nature on the air as possible. Stroke is not to be underestimated, consistency in treatment and a healthy lifestyle are the best prevention for this. All saturated fats need to be completely out of the daily menu, the same goes for concentrated white sugar that is very harmful. Instead of that you should enter unsaturated omega-3 fats and plant sugars. Cooked and fresh seasonal vegetables are mandatory item in the daily menu. If you need to consume sugar, choose brown sugar. All fish is allowed, smoked, prepare in olive oil. Avoid red meat in the diet, eat more lean meat and white (best cooked). Instead of a white or eat integral bread, also are unavoidable and whole grains. Caution with alcohol and it is allowed to have a maximum of one glass of red wine for the whole day, everything else is prohibited. These rules apply equally to all risk groups. Recovering from a stroke is unthinkable if the patient continues to smoke, and continues to drink. Annually between 25 and 30 thousand people have a stroke, and a devastating fact is that in four out of five of these patients, stroke could have been prevented if they visited the doctor in time, at the first signs of symptoms. So if you cannot laugh, nor say simple sentences, stick out your tongue or raise hands - call an ambulance! On this occasion, we give you an excellent natural remedy, which completely independently can be done at home. The recipe comes to us from the Uzbek folk medicine, and is recommended by M.Hamrajev who is also a president of the Academy. It is a drug that significantly improves motor skills and speeds up recovery after stroke. Preparing the recipe: Crushed bay leaves (30 g) put in a glass jar and cover with 2 dl of good quality olive oil. Close the jar tightly and store it in a warm place to rest for ten following days. After that the resulting oil is used as a massage of seized parts of the body. The preparation of medicinal soup: Warm up olive oil and slowly add onion, ginger, thyme, garlic and carrot and fry gently for five minutes. Now add the peas, water and bay leaf and play until it boils. As soon as that happens, reduce the heat on your stove, cover and gently simmer until the peas are softened. Then add the spinach. If you want something thicker a cream broth, use a hand blender. The consequences of a stroke are often very severe, and the recovery and rehabilitation is extremely demanding. The recommendations of doctors are numerous, but what is often absent are preparations based on herbs which can contribute to improving the situation. During the six weeks drink three cups of tea, then in the next two weeks two, and two weeks after a cup of white mistletoe tea. A small teaspoon of mistletoe, pour in two and a half dl of cold water and leave submerged throughout the night, in the morning warm up and drain well. It is best keep it in the thermos that has been rinsed with hot water. We do this in order to avoid subsequent reheating during the day, if you do not have a thermos bottle put the cup in a suitable container with warm water immediately before consuming the drink. Equal amounts of Veronica, St. John's wort, lemon balm, lavender, sage and rosemary mix well and take only a small teaspoon of everything and pour it with two decilitres of boiling water. Leave it for the next few minutes to stand without stirring. It is best to drink the mixture twice a day one cup. For stroke in men and women, an excellent essential oil of St. John's wort and thyme proved to be excellent, which is recommended for massage of seized parts. The same applies to the essence of shepherd’s purse and milfoil. Comfrey leaves are great for sized parts of the body. Pour hot water over them, while still wrapped in appropriate cloth and as a coating lean it against the body. The leaves of ferns (no stems) can be put in pillows so the patient should lie on them. They have a relaxing effect on the patient. As adjunctive therapy for stroke recommended is a medicinal bath of horsetail and yarrow with 100 grams of cabbage and 200 grams of thyme. All plants should be submerged in cold water and left all night. In the morning, the mixture is heated and added the previously prepared water in the bathtub. The patient should sit for at least twenty minutes in it. In total bath it is extremely important that the patient's heart is out of the reach of the water. The folk recipes states that in the course of one week you may for bath take only one species of medicinal plants. We hope we gave you useful information on how to recognize a stroke, so you are advised to share our text if you feel that it can be useful to your friends.